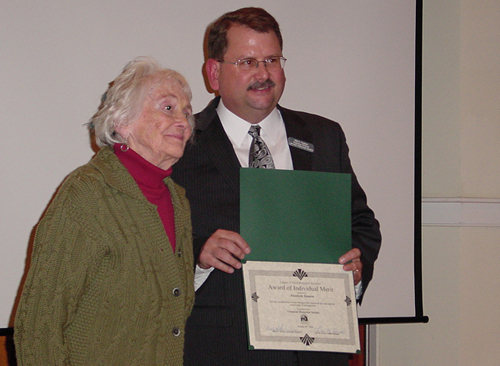 The Montgomery Historical Society's Betty Stanton was recognized by the Vermont Historical Society and League of Local Historical Societies for significant contributions to, and the study of, local history for the Town of Montgomery at its annual meeting held October 29th at the Bennington Museum. Betty was one of 34 persons who founded the Montgomery Historical Society in 1974 around the cause of saving the former Episcopal Church, built in 1835, which was purchased for a dollar and then repaired and restored over the next 36 years. During this period she served as a Director for 17 years, and President for 4 years. Major initiatives under her watch included rebuilding the clock, and bell towers, and restoration of the eight, 100+ year old stained glass windows. She also coordinated the printing of the second edition of “Montgomery: History of a Town”. She led program and fundraising events - bringing the Bread and Puppet Theater to Montgomery (twice), the Thetford Players, and organized Harvest Hey Day. She is also an annual sponsor of the “Concerts on the Common” which has brought the community an eclectic mix of summer concerts for the past 22 years. She makes several visits a year to Montgomery from her current home in Massachusetts to attend Society events and compiled and presented “Early Montgomery: A Conversation With Betty Stanton”. In it, she provided insights into the daily life of Montgomerians from the 1880s to the early 1900s by recounting her family's history. She illustrated her presentation with photos and artifacts, including family china brought by pack horse, linens and quilts made by her great aunts, a bee box used to track bees to their hives, a wooden puzzle, and letters, all of which she donated to the Society. "Her commitment to our community and the mission of our organization is unmatched" said Society Chairman Scott Perry. "Her optimism, energy, and devotion to our organization over the past 36 years has kept us focused, and motivated to expand and better serve our community. " This is the seventh individual or program award received by the Montgomery Society since 2007.